Music plays a huge role in our everyday lives. There won’t be even a single day in our life where we fail to listen to music that we love. Many people are addicted to music just like food and drugs. A lot of people have the ability to sing and compose music. Many people love to play music instruments and the number of people choosing career in music is increasing day by day. But, have you ever heard of the influence of music in kids’ development? It is a well known fact that music can influence a child’s growth and learning music will help kids with their overall developments. Music is deep rooted in our culture and everyday lives. We can come across different types of music genre and the music preference of people caries according to one’s personal preference. A lot of people take pleasure in listening to various music genres but others love to listen to only one or two genres. It is proven that if parents can build up a supportive musical environment at home, it can assist them to entertain their children and guide them to enhance crucial music skills. Parents can understand if their kids are skilled or good at music and help kids to become good musicians. Music can have a huge impact on overall child development. Parents make use of music in order to enhance kids sleeping. Mother sings song to make her child to sleep. So, children respond to the music from early days onwards. Parents intuitively bring into play music to make kids cool and calm kids. They also used to utilize music to convey their love, happiness, to connect and even to communicate. Hence, music can impact child growth, develop social skills, and assist kids of all ages with their steady growth. Another main benefit that kids get from their habit of listening to music or learning music is brain development. It has proven that musical experiences in early days can essentially speed up brain growth. It can make a huge impact in many areas mainly in the areas of language gaining and reading abilities. Some of the studies have shown that learning to play a musical instrument can get better mathematical learning and even enhance kids’ performance in examinations. Music has the capability to reinforce the relation between the body and brain. Music helps the body and brain to collaborate as a team. The contact with music from early babyhood onwards can let kids to speak effectively, build up a better vocabulary power, and fortify social and emotional abilities. Listening to music can help kids to build up their musical skills from their early days onwards. 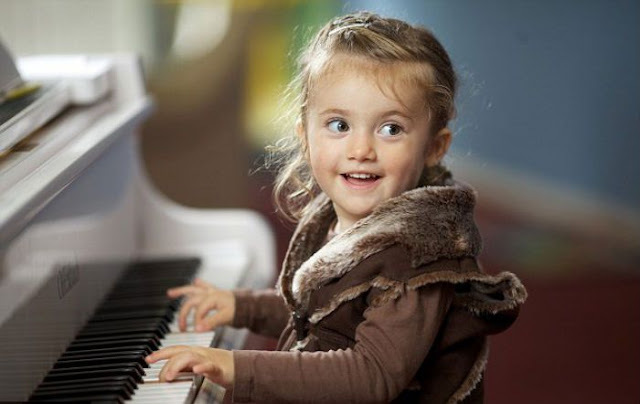 Kids usually develop their music skills by means of emulating and learning by heart rhythms and tones of songs. Children used to clap to a beat and sing in tune which can help them to develop their music skills. Without clapping to a beat and singing in tune, children would not be capable of enhancing their musical abilities. An adequate amount of motivation and contact to music is essential for kids to develop their capabilities into definite musical development. Music sets fire to all areas of child growth. It lets kids to develop skills including intellectual, language, motor, social and emotional, and literacy. Music not only leads to the development of a child but it also aids the family to use up some quality time together and have enjoyment. Introducing kids to music at the time of early days allows them to learn the pronunciation, accent, sounds and meanings of a variety of words. Kids have the habit of dancing to music and it can assist kids enhance motor skills. Music is a best method for children to practice self-expression. For children, music gives much required support to reinforce memory skills because listening to music will lead students to memorize the lyrics of music, and tune of music. I am Nicholas Byrd. I love writing and I have been writing different articles and essays for the past many years now. Currently, I help students and other people who ask me to write my essay. I have years of experience in writing academic as well as non-academic essays. Writing helps me to improve my knowledge, skills, and understanding about the world around me. I also focus on writing articles for different blog seen online when I get free time.